Oyamel could be the underdog when it comes to ranking Jose Andres’ restaurants in DC. Jaleo behaves as the flagship of the operation, minibar is elusive and mysterious and Zaytinya continues to produce memorable meals time after time. It turns out that unassuming Oyamel is underrated. Sure, the butterfly decor is a little like a science museum, and the clientele seems to be mostly tourists. But, as is always the case with Best Thing on the Menu, it’s the food that counts. A while back we double ordered the Best Thing on the Menu at Kapnos. Well, we had another repeat BTM order at Oyamel, and this time it was breakfast for dinner. The Best Thing on the Menu is most certainly Huevos Enfrijolados. 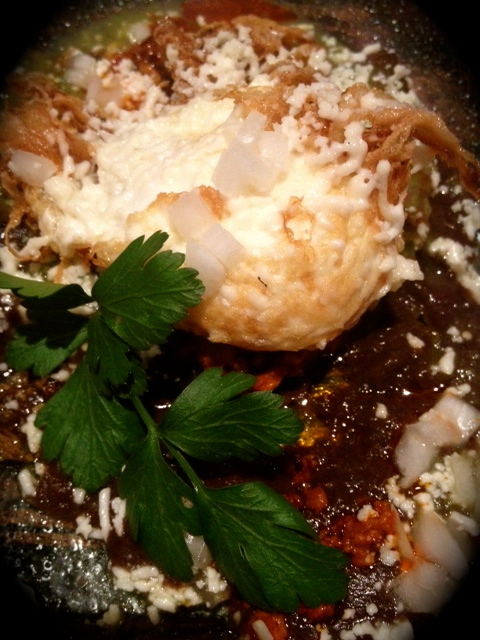 This dish is composed of a fried organic egg with black bean sauce, house made chorizo, salsa verde and a corn tortilla. This brunch munch is perfectly balanced and delicately composed. We didn’t even know you could fry an egg like that. Oyamel also knocks it out of the park when it comes to tacos. At most DC taco haunts you pick your protein: beef, pork, chicken or fish. But at Oyamel, there are four different types of pork tacos alone, plus adventurous folks can try Chapulines (grasshoppers!) an Oaxacan classic. Learn more about them here. Don’t rule out Oyamel next time you’re in Penn Quarter. It’s a little easier to get a table, the food comes out fast and fresh and you can order two of anything. Huevos Enfrijolados not your BTM? Post your favorites in the comments section.